5th Annual Beauty & Barber Awards Hair & Fashion Show | ComeSeeTv Broadcast Network ... Can you See me Now! 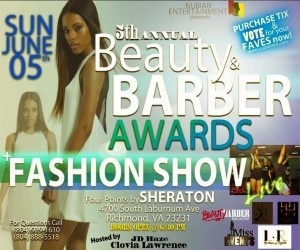 Nubian Entertainment is hosting its 4th Annual RVA Beauty & Barber Awards Hair & Fashion Show at the Four Points by Sheraton 4700 South Laburnum Avenue, Richmond, VA 23231, Sunday June 5th, 2016 at 6 PM. Recognizing some of the top salons in Richmond & Petersburg. The event will be held at the Four Points by Sheraton on Sunday, June 5th, 2016. The show features include LIVE international television broadcast, awards ceremony, performances, a fashion show & vendors.